The thunder of traditional Maori dance inside the Los Angeles City Council Chambers on May 10 helped to kick off the 2013 celebration of Asian and Pacific Islander Heritage Month. Mayor Antonio Villaraigosa made a brief appearance to praise Angelenos of API heritage and related organizations for their contributions to the greater Southern California community. The mayor offered special recognition to three individuals with community awards. 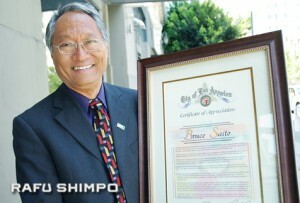 Bruce Saito, executive director of the L.A. Conservation Corps, was presented with the Spirit of Los Angeles Award, for his organization’s efforts to provide at-risk teens and young adults with opportunities for success through job skills training, education and work experience. Calling himself a servant of the public, Saito said his staff is committed to working with all of Los Angeles. “API Month is not just about hearing from folks like myself, it’s about being inspired, if not to enter public service, then to look at Los Angeles and the greater community, and how we can all continue to make this a better and healthier L.A.,” he explained. The Hope of Los Angeles Award was given to Dennis Davis, general manager of LA 18 KSCI-TV, Los Angeles’ number one Asian-language TV station, bringing news and entertainment to nearly 2.5 million Asian consumers in the nation’s largest Asian market. Following the ceremony inside City Hall, a lunchtime event with free food and entertainment was held at the South Plaza. Several local restaurants offered samples of their dishes, and a ceremony emceed by ABC7 anchorman David Ono showcased local musical and dance groups.